If you're in Cambodia, you will have to learn more about the horror of the Khmer Rouge. 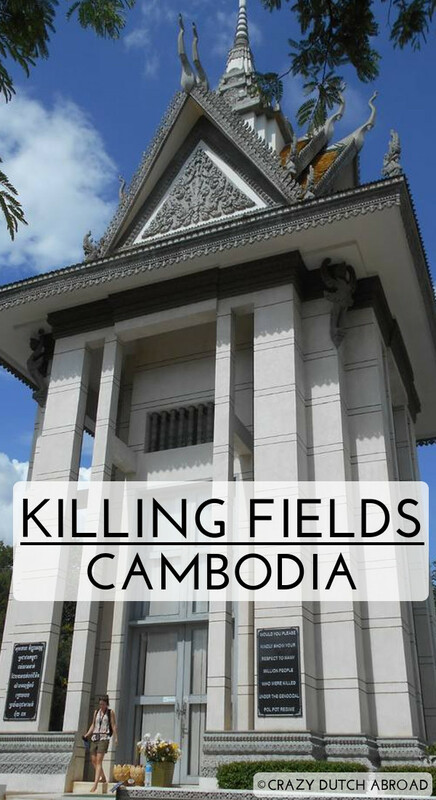 When visiting the killing fields of Choeung Ek you will get an audio set to walk around and listen to all the stories at your own pace. It is not a 'nice' thing to do but it definitely changes your perspective of the Cambodians and it is an important part of their history. By driving through the country side, especially from Phnom Penh to Siem Reap, you can see an impressive red dirt landscape and lots of green (rice) fields. It's a beautiful way to discover some rural sites and old-school farming activities. Watch people on motorbikes doing things like feeding their children, calling by mobile phone, transporting amazing objects (long and/or wide), etc. Try some of the local delights like fried grasshoppers, if you dare. Take breaks at big touristy restaurants along the way, go for the local cheap hawker stalls/markets or small restaurants. Scarecrow (Cambodian Ting Mong) in front a house to keep the evil spirits out. Phnom Pehn to Siem Reap.